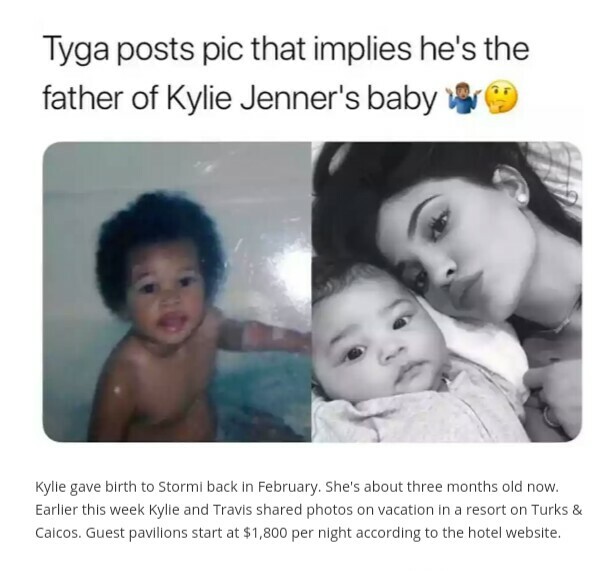 There's a new report that calls into question whether Travis Scott is the biological father of 19 year old Kylie Jenner's baby Stormi. In Touch Weekly is claiming that Travis is asking for a paternity test. But it's not just Travis, according to the report, that's worried. His mother is reportedly forcing the rapper to get a DNA test. "Travis’ mother is taking a page out of Kris Jenner’s handbook: she’s telling him to get a paternity test," an insider revealed. "She thinks it’s important for Travis to shut up all his haters who think [Kylie's] bodyguard is the father. [Travis' mom] likes Kylie but is old school and is skeptical of everything and everybody. While Travis is laughing at the rumors and thinks people are being ridiculous, Wanda wants him to be absolutely sure." Kylie gave birth to Stormi back in February. She's about three months old now. Earlier this week Kylie and Travis shared photos on vacation in a resort on Turks & Caicos. Guest pavilions start at $1,800 per night according to the hotel website.